So here it is all done and dusted! 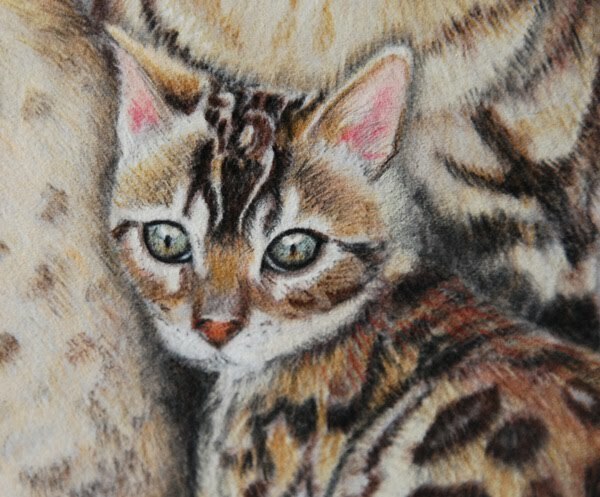 I will be delivering it to Tracey and Steve on Sunday,so I can’t wait for them to see it. It will be interesting to know what the subjects make of it. My Brit Blue, Amber went around the back of it when I showed her, to see where the cats were…;0) Bless. So it’s a short blog today – just wanted to show the finished article – I have a busy weekend of filming this weekend. My husband, John, is a photographer and we are filming his new range of photography videos in the studio, so I’m off to create the autocue and shoot list now! 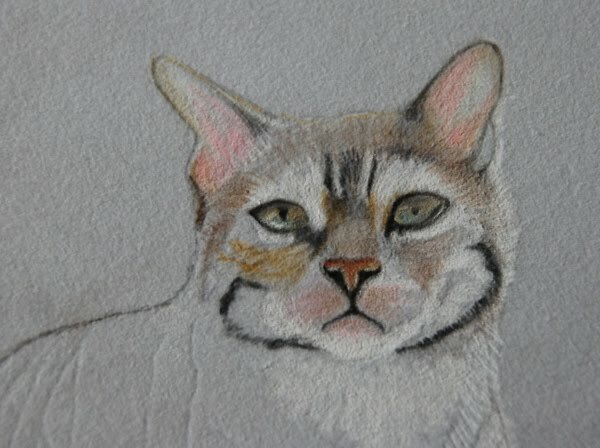 Have a great weekend all – next blog will see the start of the siamese kittens. 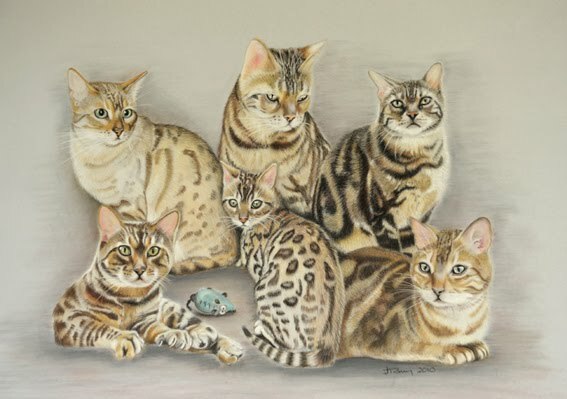 But don’t despair if you’re a Bengal lover as Spirit will be back in a couple of weeks in a painting all of his own ready for the Supreme Cat show at the NEC! It’s amazing how many people have never heard of thunder flies. I thought you got them everywhere – maybe people call them something different. They’re those miniscule 2mm long black flies that love the corn so much…and at this time of year they appear to love everything else too. For an artist it’s a nightmare as they get into paintings under the galss and you end up with a little flurry of them collected in the corner of white mounts. This year they have managed to slip inside my PC screen and my laptop screen – actually inching their way throufh the liquid crystal until they can go no further. Now I hvae strage little commas in the documents that I write until I realise that it’s a thunder fly! Anyway that’s not what you came here for is it? 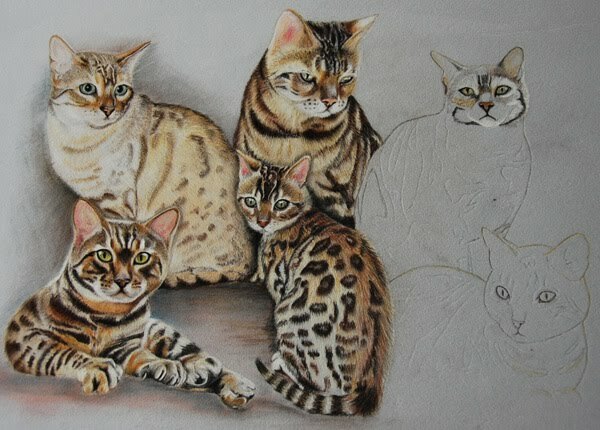 I have been cracking on a pace with the Bengal family and shortly I’ll be starting on Jasper – the last cat in the piece. 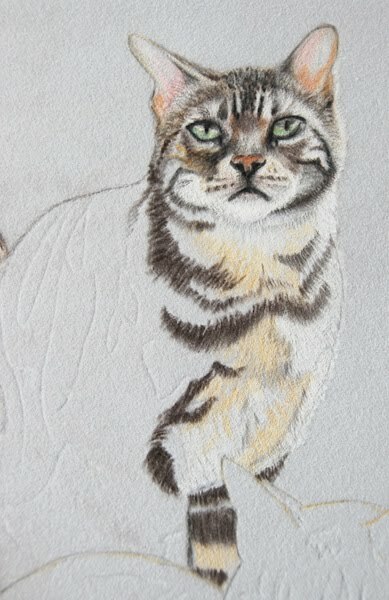 Here’s Carminah 90% finished – no whiskers yet. Her eyes are amazing colours, clearly she’s at that age here where they’re still deciding what colour they should be! There are flecks of almost everything in there. Here you can clearly see the layers building. 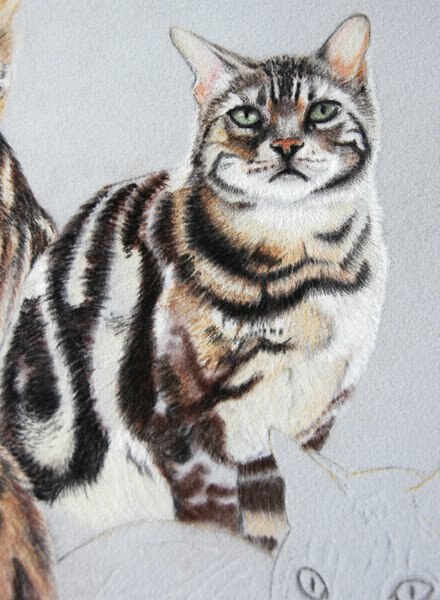 For some reason, Sonnet does not look happy to be having his photo taken herewhich I think adds to the character of the piece. They all have their own particular expressions. In these two images you can see how the whole thing starts to change as the dark tones are strengthened. 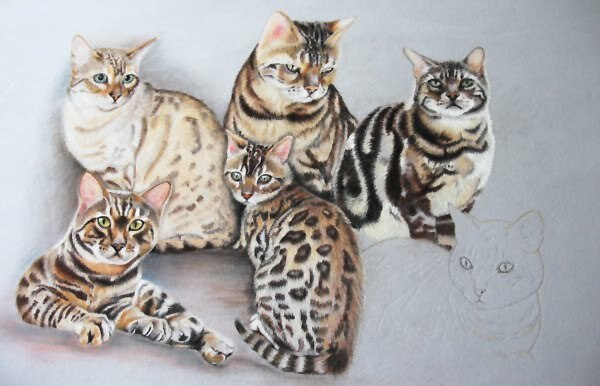 Each cat that is finished anges the whole look of the composition. 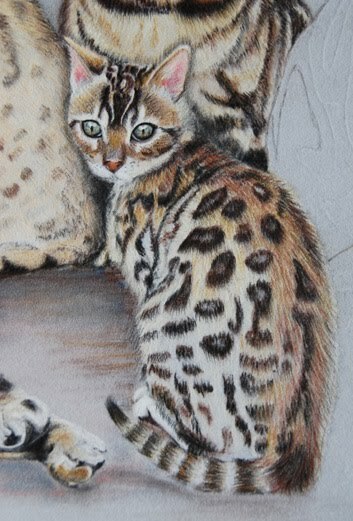 Spirit is very striking in his markings and fairly vibrant and Sonnet balances this out nicely. At the moment Shadow stands out as the palest of the bunch, but once I start on Jasper, these two will balance up nicely. You will find me this weekend – Friday, Saturday and Sunday – at the East of England showground in Peterborough at “Just Dogs Live!”. 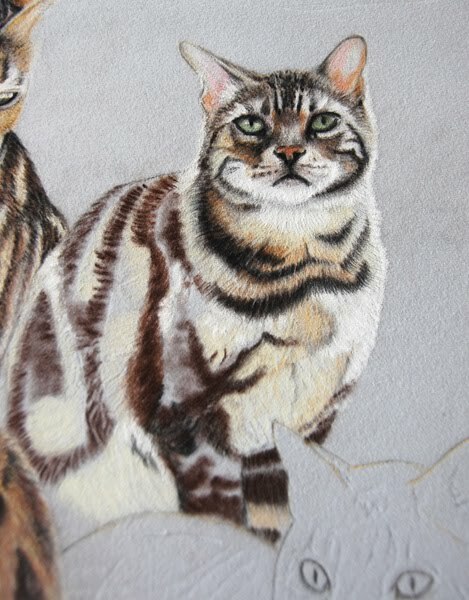 No doubt I will be putting the finishing touches to this piece and starting on the next commission. If you get a chance to go – I might see you there.